Tunisian Adventure awaits – CANCELLED. THIS TOUR IS NO LONGER TAKING PLACE. Moez Sghaier is no longer a legally licensed guide in Tunisia. We at Star Wars Places have just recently made contact with a tour company operating in Tunisia offering tailored experiences for those looking for a far more immersive experience. They offer professionally guided, tailor-made, in-depth tours for solo & individual travellers, and small groups, in English, French, German & Italian (and Arabic). We offer special Cultural, Archaeological and Alternative Tours – Inc Star Wars related. Set-up by a couple, who have a passion for Tunisia’s natural beauty and hidden gems. With over 25 years of experience in Tourism, Moez Sghaier is an Official Tunisian Guide, as well as a Translator, Interpreter & Fixer. He speaks fluently French, English, Italian, German, & Classical Arabic and has a passion for History & Cultures. Yvette, is a Professional Tour Leader with over 20 years of experience. She is originally from Canada, and has an academic background in Classical Archaeology. She specializes in organizing tours not only of Tunisia, but also of the Ancient Mediterranean (Turkey, Greece, Italy & Sicily, Morocco, Jordan, Syria, Libya, Egypt, etc.). Running from April 23rd – 29th Tunisian Journeys will be hosting the Academy Award winner Roger Christian in Tunisia, during the filming of his forthcoming documentary, Behind The Force Movie. Roger Christian will be coming to TOZEUR, MATMATA & DJERBA, with cameraman Mark Dodd, for the filming of his forthcoming documentary, “Behind the Force”, about the making of the original Star Wars film: Episode IV – A New Hope (1977). He will be bringing with him the original iconic LIGHT SABER which he created for the film. For more information on this amazing event go to the Facebook link to discover how you could meet a legend in a legendary place! 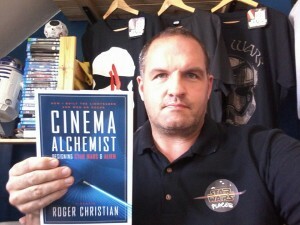 His book CINEMA ALCHEMIST is a great read and has loads of stories about the making of Star Wars & Alien.